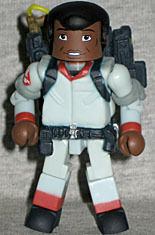 In much the same way that Bill Murray overshadowed the rest of the cast in the live-action film, Peter Venkman was the star of the cartoon. Of course, there he was voiced by Lorenzo Music, who was the first voice actor I can remember recognizing by ear as a kid - you could just tell that Peter Venkman, Garfield and Tummi Gummi were all the same guy. The Minimate gets a new hair piece, of course, to create the cartoon's flippy bangs (as if Billy Murray has thick, luscious hair - yeah, right!). His jumpsuit is brown with blue trim, so he still has a real-world look. If you remove the reused chest cap, he still has his uniform details printed on his chest, so he doesn't end up looking weird. 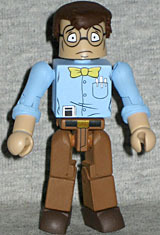 Next in the set we have Louis Tully, the Ghostbusters' accountant - yes, even he made the jump from screen to tv. Because there's nothing kids love more than nebbishy little wimps who are into math. He's wearing his normal clothes: a blue shirt, brown pants and darker brown shoes. He accents all this with a bright yellow bow tie, because fashion. There are three silver pens in his pocket and a calculator tucked into his belt. He gets the "short sleeve" rings that many Minimates have, but they're in the wrong place: looking at images of the cartoon, he wore his sleeves rolled up above his elbows, not below them, so the blue paint would have to stop much higher. The hair's not quite right for the show, but that's a hard design to capture. Winston Zeddemore plays the same role on the cartoon that he did in the movie - he was the "common man" on the team, keeping the three scientists he works with from getting lost in their own heads. He was voiced on the show by Arsenio Hall, despite the fact that Ernie Hudson auditioned for the role himself. His uniform is powder blue with red trim, because it was the '80s and you had to make the scary black guy as non-threatening as possible. His chest cap is the same one Peter has, which means this set only has one type of uniform, while the other set had two. That seems unfair. Maybe it was a cost thing. Both GBs already come with proton streams and ghost traps, and the last figure in this set is a biggie. The Stay-Puft Marshmallow Man appeared in every episode of the cartoon - but mainly by virtue of being in the opening credits. He did have a few legitimate appearances on the show, but then he was more like Slimer: a friendly ghost (just one that was too big to let out of the containment unit very often). This figure uses all the same parts as the other Stay-Pufts, but the plastic he's molded from is is semi-transparent rather than solid white, which makes him look more ephemeral. 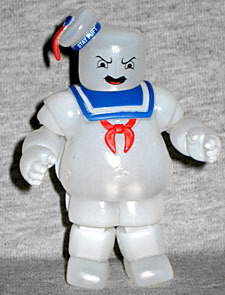 This sugary sweet marshmallow mascot may have nothing but love in his heart for the Ghostbusters, but his face is very angry. Maybe it's supposed to represent the version from the opening; he was kind of mad there. It's very convenient that the Ghostbusters team had four members, two human friends, and two noteable ghosts - it makes a simple and easy breakdown into two four-packs. There were the requisite TRU two-packs, as well, but you could get the main cast very easily.